It’s that time of the year when athletic scholarships determine where thousands of seniors will be heading to for their first year of college — and we have our share of athletes competing (and winning) these scholarships. Oscar Miranda recently accepted a scholarship to play football at a university. Only 2% of high school athletes win sports scholarships every year at NCAA Colleges or Universities. As for Division 3 Colleges, they don’t offer full-ride scholarships. Here at Morton High School we have a few students who have dedicated either their whole life or high school career to sports; and their hard work payed off — from having $12,000 a year to a Full Ride scholarship. 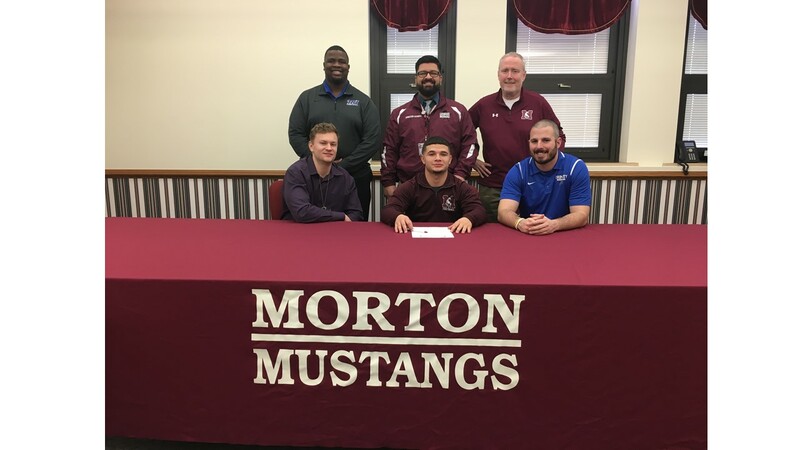 Senior Oscar Miranda received and committed to a full ride scholarship for football to Trinity International University. “Stressful but fun,” Miranda described his life as a student athlete. Senior Sean Black received a scholarship for football to Benedictine University. “My experiences were great. I love the coaching at Morton, the football staff were amazing, they’re literally family to me ,” Sean said when asked about his experience playing sports in Morton. Senior Erick Avila received a scholarship for volleyball at Loras College to whom he is verbally committed to. “I feel like as an athlete there’s going to be times where you question your commitment and wether you’re doing enough but it helps knowing its all going to be worth it at the end,” Erick said. I think that sports is a great thing to doin high school. It helps with making friends and staying fit, and the possibility of getting scholarships. Getting an athletic scholarship and something every student athlete strives for. It’s awesome that student athletes are getting recognized for their hard work. Being a student athlete isn’t easy. It takes a lot of determination and sacrifice. Especially when you’re a student athlete with AP classes. It’s amazing to hear how Morton students have dedicated their life to sports and have received a scholarship or full ride to a college/ university due to it. Being a student athlete can be stressful but eventually in the end it’s worth it. They have shown potential and commitment and from that, they have been recognized to go on in life doing something they love doing! It’s quite amazing the many opportunities Morton offers to students who are going off to college. Especially to those students who have dedicated their whole lives to a particular sport and have been so commited. I love how many athletes are working extra hard to win those scholarships and it’s all worth it in the end. Seeing student athletes being offered scholarships is awesome. Especially being the fact that only 2% of high school athletes are offered this opportunity. This is to hope someday to be me. Its going to take a lot of work but it’s possible. Full ride scholarships is an amazing experience for students who put almost if not their whole life into sports dedication. This is to prove that if you work hard, you can achieve the most. I think that this is an awesome chance for athletes. The reason behind me saying this is that, some athletes has dedicated their whole lives for playing sports and to see it pay off at the end is truly amazing. I think that the scholarship is going to be a relief for their parents seeing as the parents have spent their time and money into making sure that they are playing the sport that they want to play. Also I have some concerns to this scholarship and the rationale being that some people who are being given sports scholarships to universities end up going to the universities and only playing sports without even worrying about their academics. This meaning that most people on sport scholarship only play the sports that they are in for and don’t do much about their education since the university expects them to play the sports that they are in for. But overall, I think that this is an amazing opportunity and that they should take it when prompted with it. I think that it is amazing what students can achieve at when they put their mind to it. These seniors put hard work and effort into sports and now they have scholarships. They should be really proud of themselves for the sole reason that no many athletes get these scholarships. These seniors are putting a great example for future students by showing them that anything is possible.These students are really inspirational for up and coming athletes in high schools. Their heart and soul went into their sports and that is incredible. It is amazing that many students that are in sports have the opportunity to get a scholarship doing what they do best. Being an athlete takes a lot of energy and time, it can effect the students school work and homework, but i think is great that most can have a balance. In order to be or stay n a team the person needs to have good grades, and it comes to show athletes put a lot of effort in school and their team. I agree with this article, many student athletes put in the work every single day to hopefully go big one day whether it be in the pro leagues or in college at least. Student athletes have it just as hard as AP students when it comes to enduring with all the work one has to do. In fact, many athletes have AP classes themselves and have to do a bunch of homework after coming back home exhausted from practice. We should respect both, as being an athlete means being dedicated to your sport every single daywhile being an AP student means being dedicated to schoolwork every day.